The depth of the talent pool in Buffalo is such that many good shows can be run simultaneously, with a half dozen major productions up right now, although some are better produced than others. At the top of anyone's list should be SIVE at Irish Classical, a take your breath away experience. 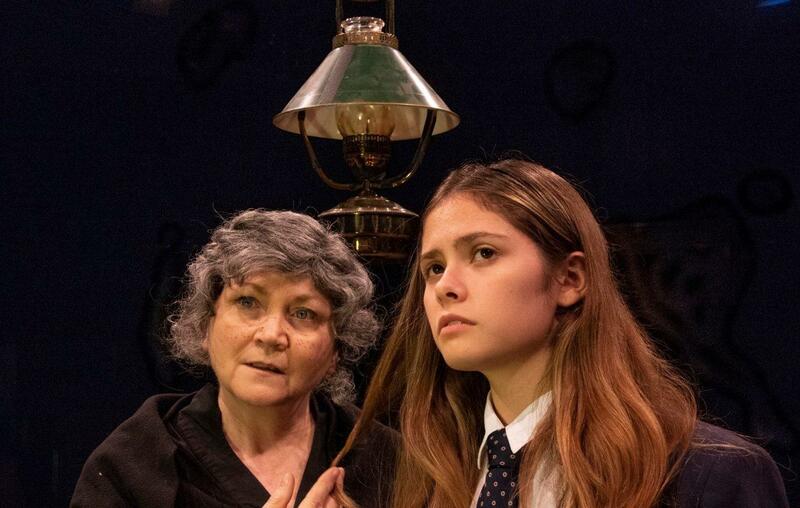 In SIVE on stage at the Irish Classical Theatre, grandmother and granddaughter, Josephine Hogan with Kiana Duggan-Haas, are equally concerned about the future of the young girl. AFTERGLOW, play by S. Asher Gelman presented by Buffalo United Artists, directed by Todd Fuller, starring Jonathan Beckner, Christopher Clark, Mickey Harmon. Nov 2-24, Fri & Sat at 8 plus Nov 18 at 7. Alleyway Theatre, One Curtain Up Alley (886-9239). LITTLE SHOP OF HORRORS, musical by Ashman & Menken presented by Niagara University Theatre, directed by Steve Braddock. Nov 1-11, Thu at 7, Fri at 7:30, Sat at 2 & 7:30, Sun at 2. Leary Theatre, Clet Hall, NU campus (286-8685). THE MYSTERY OF EDWIN DROOD, musical presented by The Niagara Regional Theatre Guild, directed by Dawn Marcolini Newton, starring John Panepinto, Adrienne Ricchiazzi, Sydney Bucholtz, Lucas Colon, John Parascak. Nov 2-18, Fri & Sat at 7:30, Sun at 3, plus Oct 17 at 3. Ellicott Creek Playhouse, 550 Ellicott Creek Rd., Tonawanda (260-2319). THE TAMING, play by Lauren Gunderson presented by The Brazen-Faced Varlets, directed by Lara D. Haberberger, starring Jennifer Fitzery, Jessica Leigh Tokarski, Emily Yancey, Stefanie Warnick. Through Nov 3, Fri & Sat at 8. Alleyway Theatre’s Main Street Cabaret, 672 Main St. (598-1585). Theater Talk: SPEED-THE-PLOW, FIDDLER, MOTHER JONES, all top notch, and 5 more openings this week! Ever since Curtain Up! 2018 the season keeps building momentum. A thrilling Bartlett Sher production of FIDDLER ON THE ROOF, a tight breathtaking ensemble with David Mamet's SPEED THE PLOW, and a beautifully sung, very touching MOTHER JONES IN HEAVEN (AND HELL) and five more promising openings this week, three of them tonight!